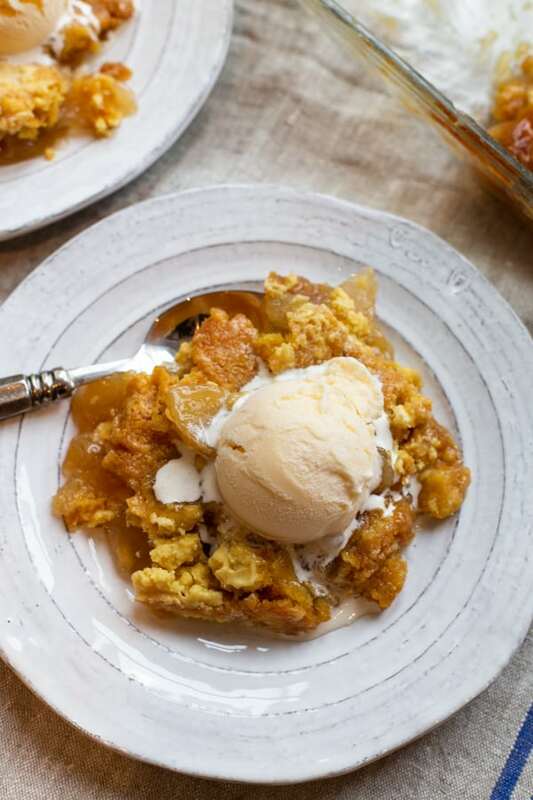 This amazing Apple Dump cake is going to be your Fall go-to dessert! It’s packed with apple flavor with the addition of a caramel drizzle. 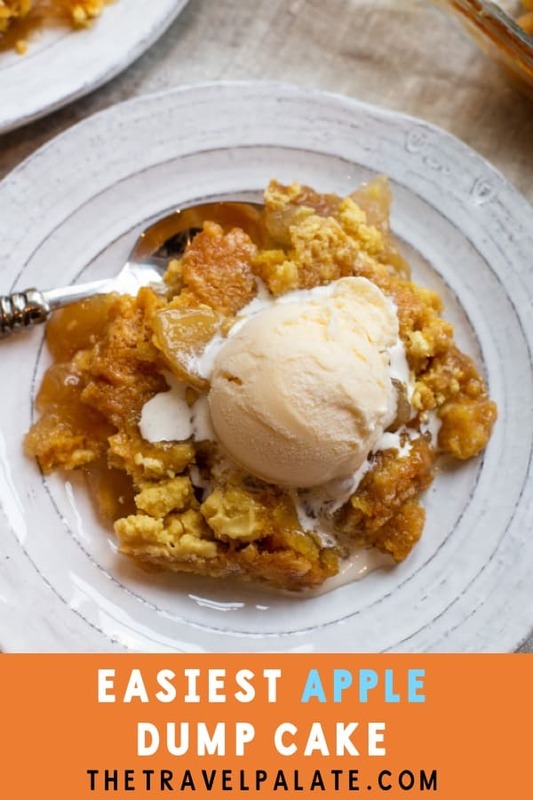 You will love how easy Apple Dump Cake is to make! It would make the perfect Thanksgiving dessert, or just a nice treat for friends and family after dinner. I’m such a fan of dump cakes, and this Apple Dump Cake is what got me hooked on them. If you’re not in love with this type of recipe then I’m here to convert you! I’ll admit it. I used to think that using cake mix was some kind sin. Some sort of short-cut that only those people used. Who are those people? Busy people that like dessert–people like me and you! Short-cuts are the bomb! And even though I’m not nearly as busy today as I was in the days when my kids were young, I still make this Apple Dump Cake regularly because I can keep the ingredients on hand and have a homemade dessert in less than an hour! 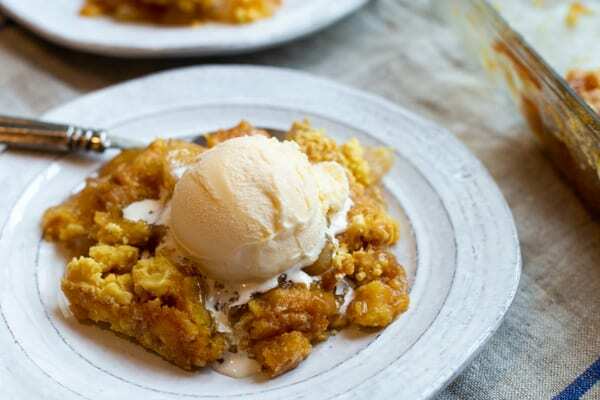 This Apple Dump Cake is a great anytime of the year, but is especially delicious in the fall and for the holidays like Thanksgiving and Christmas. If you’re craving a sweet apple dessert, make this Apple Dump Cake today! Heat oven to 350. Spray a 13 x 9 baking pan with non-stick cooking spray. Dump the apple pie filling in the pan and spread it out to the edges. Top the apple filling with the packaged cake mix, spreading it to the edges as evenly as possible. Place the thinly sliced butter all over the cake mix, spacing out evenly. Finish by drizzling the caramel topping over the cake. Bake for 35 to 40 minutes. Cool for about 15 minutes. Top with ice cream if desired. Store leftovers in the refrigerator for several days. It may be tempting to add more caramel topping, but I found that 1/3 cup does the trick. You can always add more after it bakes. Nutritional information is an estimate and doesn’t include ice cream. 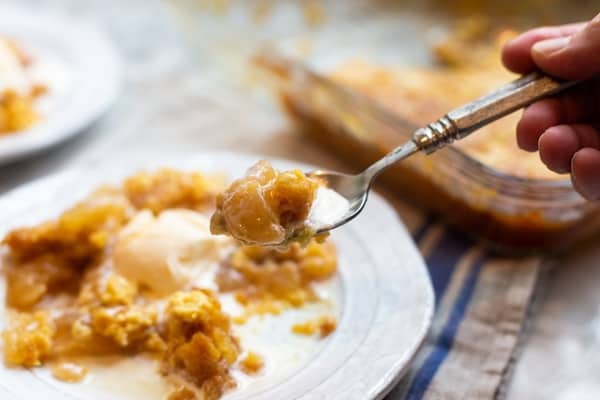 If you made this Apple Dump Cake, or any other recipe on the blog, don’t forget to leave a rating and a comment below. I love hearing from my readers! 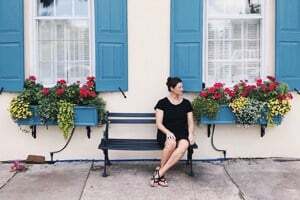 You can also find me on Facebook, Instagram and Pinterest! 4 ingredients???!! Now this is my kind of recipe! I need to make this ASAP because it sounds amazing. I agree! Shortcuts are so great! I love making dump cakes, but I’ve never made an apple one before! I have to give your recipe a try! I am loving this apple dump cake recipe. It is perfect for these beautiful fall apples. I can’t wait to make it for my family. Sounds and looks absolutely heavenly! This is a perfect autumn dessert! Thank you for sharing always super yummy recipe Nikole. I don’t use cake mix, I feels like I am cheating…but I will definitely try this recipe.